Aftermath of fatal balcony collapse in Berkeley, California. 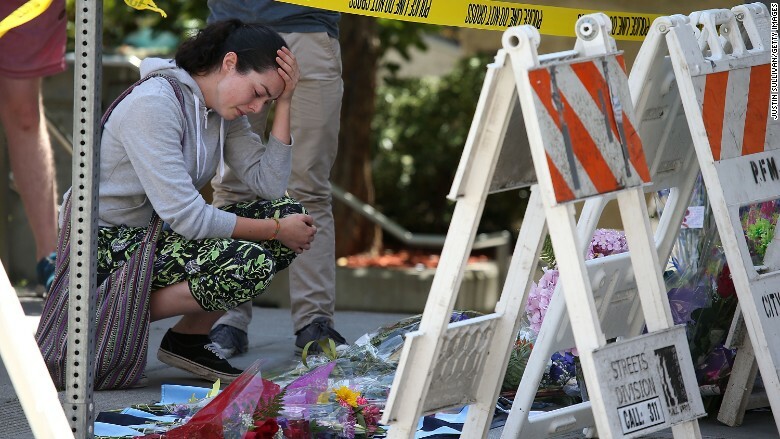 Ireland's ambassador to the United States sharply criticized the New York Times on Wednesday for a story about six Irish students who died after a balcony collapsed in Berkeley, California, earlier this week. Ambassador Anne Anderson wrote the open letter to the Times to highlight what she described as "insensitive and inaccurate" language in an article about the deadly accident. Five of those victims were Irish, while the sixth had dual citizenship with Ireland and the United States. In its story, the Times wrote that the work-visa program that brought those students to the U.S. has "become not just a source of aspiration, but also a source of embarrassment for Ireland, marked by a series of high-profile episodes involving drunken partying and the wrecking of apartments in places like San Francisco and Santa Barabra." As Anderson and several other readers saw it, the Times was blaming the victims before all of the facts have come out. Anderson said that the vast majority of Irish participants in the program "behave in a way that does Ireland proud." The disaster occurred early on Tuesday after 13 people had gathered on a balcony at a Berkeley apartment complex. Along with the six who died, seven other people sustained injuries. Margaret Sullivan, public editor for the Times, said her office "fielded hundreds of complaints" after the story was published online. Sullivan concluded that the "thrust of the story was insensitive, and the reaction to it understandable." It would have been more appropriate to examine the building's structure, Sullivan wrote, rather than the behavior of the students. Adam Nagourney, the Los Angeles bureau chief for the Times, was one of three reporters who co-wrote the original story on the balcony collapse. "There are obviously positive aspects to the program, which has been a great resource for thousands of young Irish students, as well as negative ones. Looking back, I had the balance wrong; I put too much emphasis on the negative aspects, and they were too high in my story," he wrote in an email that was published by Sullivan. Nagourney contended that the visa program was "fair game for a news story," but he acknowledged that it could have been addressed in a more sensitive fashion. "I absolutely was not looking to in any way appear to be blaming the victims, or causing pain in this awful time for their families and friends," Nagourney wrote. "I feel very distressed at having added to their anguish."